There are only a few places in the world that remain unharmed by tourism and overfishing. Fiji is one of them, specifically the Fijian island of Kadavu is one. Fiji, officially the Republic of Fiji, is an island country in Melanesia in the South Pacific Ocean about 1300 miles (2000 km) north – northeast of the North Island of New Zealand. Its closest neighbours are Vanuatu to the west, New Caledonia to the southwest, New Zealand’s Kermadec to the southeast, Tonga to the east, the Samoas, Wallis and Futuna to the northeast. Tuvalu is due north. 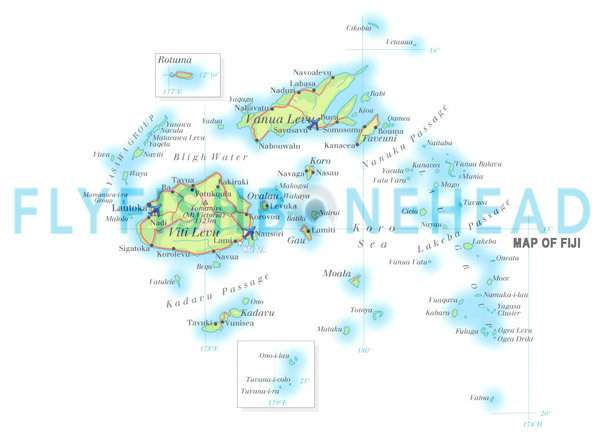 The country is made up of a 332 islands & 500 islets, creating a large archipelago (island chain or island group), of which only 110 are inhabited, The two major islands, Viti Levu and Vanua Levu, account for 87% of the population of almost 860,000. The capital and largest city, Suva, is on Viti Levu. About three-quarters of Fijians live on Viti Levu’s coasts, either in Suva or in smaller urban centres like Nadi (tourism) or Lautoka (sugar cane industry). Viti Levu’s interior is not heavily populated beacuse of the terrain. The majority of Fiji’s islands were formed through volcanic activity starting around 150 million years ago. Today, some geothermal activity (volanic activity) still occurs on the islands of Vanua Levu and Taveuni. The Great Astrolabe barrier reef that surrounds Kadavu is one of the largest barrier reef in the world but is virtually unexplored and un-fished. From the edge of the reef, the ocean floor drops plummets to about 500 meters and is almost 2 miles deep(~3 kilometres) within 2 miles of shore. This island is the pinnacle of gamefishing in the Pacific of all tropical species. Kadavu while isolated, is just a short plane ride from Nadi or Suva. There are 3 larger main airports, 9 other intermediate sized airports and several dozen random airstrips that exist. Considering the relatively small size of the landmass there are a total of 48 airports & airstrips in Fiji making it easy to get places. The International Airport is located on the north, northwestern corner on Viti Levu in Nadi. Mahi-Mahi (Coryphaena hippurus) (aka Dorado, Dolphin, Lampuga, Lampuki, Lapuki, Maveriko) If you're interested in catching super-strong, beautiful, not-too-choosy, leaping fish, here ya go. These are the saltwater equivalents of bluegills, except they jump, and they get big. Like as big as your aging retriever. The common English name "dolphin" causes much confusion and lots of hand-wringing. Let's be clear: this fish is not related to the marine mammal also known as dolphin (family Delphinidae). This is the fastest fish in the ocean! Individual Sailfish have been clocked at speeds over 70 mph which is the highest speed reliably reported in any water creature. Sailfish are two species of billfish, the Atlantic Sailfish and the Pacific Sailfish and live in warmer sections of all the oceans of the world. One of the best kept secrets in all of salt water fly fishing is the Spinner Shark migration in late winter through early spring in. It happens in a place where you least expect it...West Palm & Fort Lauderdale, Florida. Really, we aren't kidding. This is spring break for sharks. They migrate to the beaches off of Fort Lauderdale and West Palm Beach chasing fish (snook, blues and false albacore & other tuna species) that are breeding & feeding in the surf or just beyond the surf. You can sight fish for a 100+ lb. powerhouse in just 8 feet of water. Flyfishbonehead had so much fun that we went out twice in 2012, hooked 9 and landed 5 on our first trip and landed 5 of 6 on the second. Considering the fight and how hard it is to subdue this beast that was pretty darn good. Giant Trevally require a 12 weight. A 12 weight for the added lifting power & greater control increasing chances of landing the fish. It will also eliminate wind as a factor as even a novice caster has little difficulty punching a 12 line through the wind. You MUST have a sealed drag and made for saltwater fishing. We use the term ‘bomb-proof” which means means tested & proven. It is vital to successful GT fishing. Your GT reel should have the following features: 1. Very few or no moving parts 2. Smooth drag with smooth start-up 3. Sealed drag which will not corrode 4. It will not fail under any circumstance Use a specialty floating line which has a braided 50 lb core. We also recommend 400 yards of 60 lb backing, you’ll need it. Leaders should be 6-9 feet with at least a 60 lb shock tippet. Our most popular is a 6 foot (2meter) piece of 60 lb. fluorocarbon with no taper. Just tie the fly right on. Milkfish (& Queenfish) require a 10 -12 weight, use a 12 weight for the milkfish & a 10 for the queenfish. Queenfish put up a great fight but are usually acrobatic giving the angler a chance to gain line easily. A saltwater reel with a sealed drag made for saltwater fishing. Which is ‘bomb-proof” which to us means simply a tested & proven reel with the following features: 1. Very few or no moving parts 2. Smooth drag with smooth start-up 3. Sealed drag which will not corrode 4. It will not fail under any circumstance Clear floating lines are best and an intermediate sinking line is very useful to have if there is significant current or the fish are deeper in the water column feeding. Leaders should be 9 – 12 feet with anywhere from 15-20 lb tippet. Fluorocarbon is highly recommended when fishing for milkfish in crystal clear Christmas Island waters. small minnow patterns like surf candy & eat me Marlin/sailfish: Poppers, Baitfish-mackerel & sardine patterns. Sun protection clothing: long sleeve shirt long quick dry pants breathable buff style headgear, hat or visor (with black brim on underside if possible) Wading boots with gravel guards.